Check out this smiling fox, who was captured using an abandoned conveyor belt as a play slide.It was originally posted at Metro UK. Loving life: The fox zips down its makeshift slide Picture by Duncan Usher. Another animal recently partaking in human-esque activities was one clever orangutan from Japan, who used a wash cloth to clean his face and cool down during the heat of the day. The amazing footage was captured by a stunned guest visiting the Tama Zoological Park in Tokyo and the clip has since gone viral across the world. If you have a dog (or cat) this lengthy post on how easy a natural diet for your pet is, improving both health and vitality, might be worth a read! Recently my dog Monty was ill. It happened twice and it was for a couple of days before he was feeling better but both times were weeks apart. We couldn’t work out what was making him ill, he was sick, had bad mucusy poo and was feeling sorry for himself. After a couple of vets check ups it’s a still a mystery but we have solved the issue by examining and changing his diet.Monty is a 9yo German Shepard dog who weighs 43kg. 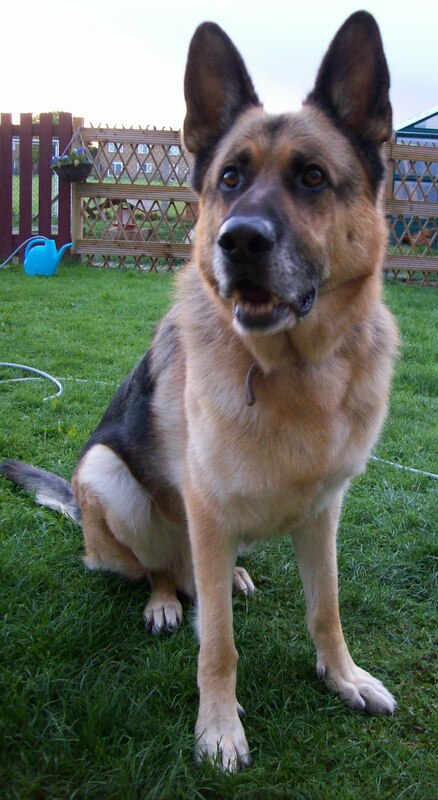 He has been a multi handler kennel living working dog most of his life and his previous handler did not care for all his needs adequately; he came to us very underweight, no appetite and with bad teeth. He was a misery and although recently has become solely a pet and after 18months life of riley with us he still isn’t a foodie. I worked with him for a year but the past 6 months I had to give up security due to my pregnancy so since then he has been a pet dog. Whilst Monty was ill he was fed a bland gentle diet of rice pasta and chicken. I then started researching dog food ingredients, we then slowly moved him onto a higher quality dry dog food. It seems that factory produced dog food is not a load of tripe – its worse! Several of the big brands are mostly cereals, CEREALS! Dogs are carnivores, not omnivores like us – they do not need vegetables or any kind of wheat products. The higher quality dog food is better but still has a lot of wheat fillers. Regardless of this for Monty the better dry food worked wonders, his energy levels rose and he was happier, even his coat looked better. He also pooed less and had a much better stool. The only problem was the cost. By far the best dry dog foods would cost £60 or £70 for a month for to feed a dog of Montys stature. A neighbour of mine feeds her dogs – both GSD – for £20 each month on the best and most nutritious diet available: Raw food. 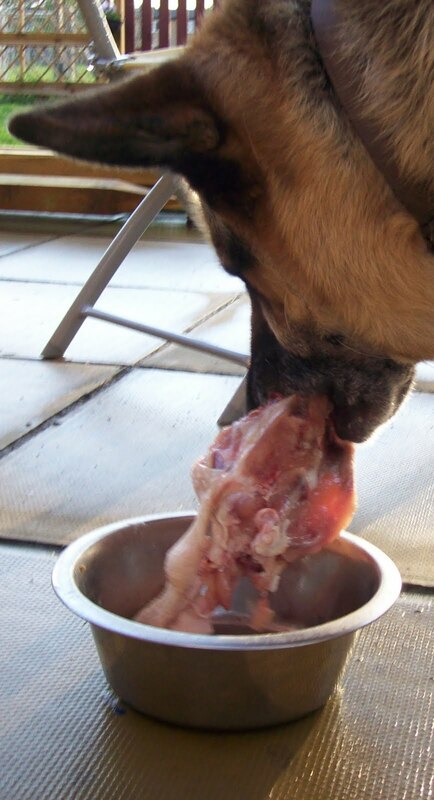 Its a third of the price and twice as good for him, it consists of raw meaty bones left over from the butcher, imitating natural evolution of dogs diet. I took some advice from our neighbour and after a little research gave it a go, turns out it is dead easy! Everything I have read promotes this raw diet as the most natural way to give your dog the nutrients he needs, not only that but it aids digestion and cleans his teeth. Imitating nature means that it is so easy – lots of people ask how much and how often to feed and how to know if your dog is getting what he needs. The general consensus is he will tell you! As long as he is at a healthy weight and you are feeding 3% of your dogs weight daily and 70% of that as raw meaty bones he should be fine :) Feeding an additional small amount of muscle meat (organs like heart and liver) once a month gives the additional vitamins he needs. Lots of people are put off by this diet, maybe they are squeamish or think its not healthy for their dog (or cat!) to have un-cooked food but just remember dogs are not people they don’t need all that rubbish that is in store bought food. We have ordered one month supply of local chicken carcasses and tripe - both are frozen so easy to store. Its so easy, we simply defrost it every day for him and he wolfs it down, he really enjoys it and I highly recommend it!